by Annelyse Bartolo of Consolidated Biscuit Co. Ltd. Checking is a phenomenon which occurs when small hairline cracks develop in biscuits and crackers. These may consequently result in breakage when the product is exposed to minimal force. These cracks present a weakness within the cracker structure which facilitates the tendency for them to break along these imperfections. Checking occurs sometime after the crackers are baked and packed, generally a few days after their manufacture. The fact that this phenomenon is only visible days after packing makes it hard to assess for in real time during production. As the cracker bakes, moisture is lost from the dough piece and stress gradients start to develop within the cracker which eventually come to an equilibrium. The way these gradients develop and equilibrate is said to affect the degree of checking. The process of checking may start immediately after baking through small fractures that may not be visible but gradually grow to become more evident over time. The use of a well-balanced recipe is important when trying to reduce checking levels. Generally, recipes with higher fat levels tend to be more flexible and stresses are relieved more easily after baking, whilst recipes with a higher water content tend to be more prone to checking. Use of very strong flours may also be conducive to checking due to the higher water adsorption capacity and stronger gluten formation ability. Fermentation time can also be linked to checking levels. Short fermentation times may result in a tough dough which will enhance stresses within the dough piece, whilst longer fermentation times show lower checking levels. As fermentation progresses the gluten structure within the dough starts to break, facilitating the ease of removal of moisture from the dough piece during baking. The longer the dough is left to ferment the softer the dough becomes and consequently the water added to the mix may also be reduced. The mixer type, mixing time and mixer speed used are also key in ensuring a consistent and homogenous dough where all the ingredients are evenly distributed. Separation of ingredients prior to sheeting will result in stresses within the dough pieces. The final dough temperature is also of significance when fermented doughs are used or when enzymes and dough improvers are added to improve checking levels. High levels of inclusions within the recipe may also promote checking. The amount of rework used should also be controlled since excessive use may give rise to internal stresses within the dough. Poorly developed crackers are more prone to checking than crackers which are more aerated and have a better lift. In this regard the higher the number of laminations used during sheeting the lower the tendency for the crackers to check due to the achievement of a more open texture. During sheeting the uniformity of dough piece weight should be assessed. Dough weight variations across the conveyor belt should be kept to a minimum to allow for a more even bake. Another important factor in the machining of the dough is that fresh and recycled dough from the cutting stage are evenly mixed together and as much as possible similar in temperature. The cutter used can also effect checking, the number of docker pins as well as their distribution and size should be evaluated. With the ideal configuration of dockering a more even moisture loss from the dough piece can be achieved. Higher levels of docker pin holes facilitate the removal of moisture from the interior part of the dough piece during baking. Checking can take place in any size of cracker however larger or denser crackers have a higher tendency to check since they tend to be more rigid. To reduce stresses within the dough pieces the level of shrinkage of the dough piece after cutting should be kept to a minimum. In this regard the use of softer and more extensible dough may be beneficial. Dough crushing at the gauging steps should be avoided since tension put in the dough at the time of sheeting can also cause checking. Relaxation of the dough across the sheet particularly immediately before cutting is recommended. Checking is generally considered to be a consequence of moisture re-distribution after baking in relation to the elasticity of the cracker structure during and immediately after baking. Dense and less aerated products tend to have a more rigid structure and retain more moisture within the centre of the product making them more prone to checking. Product placement on the oven band should be close together without too much space between one dough piece and another. 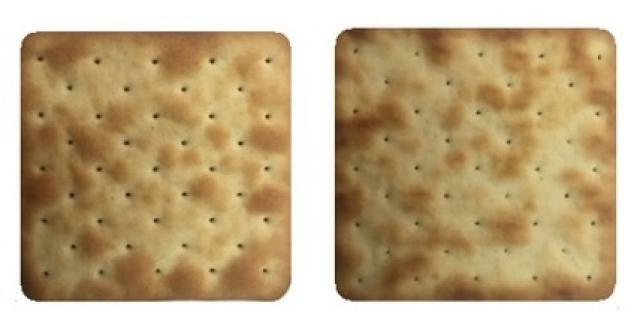 Under-baked crackers with high overall moisture content should be avoided. 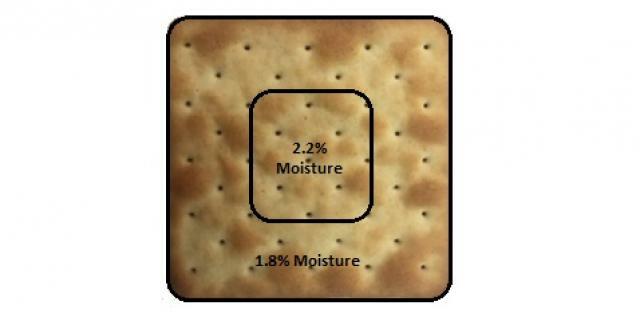 One should check the moisture gradient within the product, this can be found by separating the centre part of the cracker from the periphery and taking individual moisture readings of the two, ideally only a small difference should be present. After baking, moisture will migrate from an area of high concentration to areas of lower concentration to achieve equalisation within the cracker structure. This movement will create strains on the internal matrix and a crack can form if this is not strong enough. Post baking dryers at the oven exit will significantly reduce the moisture gradients and therefore eliminate checking arising from this cause. The moisture gradient may be minimised by assessing the temperatures, air circulation and humidity levels within the oven. Humidity is needed in the first quarter of the oven to speed up the penetration of heat to the centre of the dough piece. In some ovens steam is also pumped into the first zone however excessive humidity will give rise to thinner crackers therefore a balance needs to be achieved. Crusting of the dough pieces too early in the bake cycle seals moisture in the core of the cracker. It is important to utilise as much of the oven as possible, maintaining a balance between top and bottom heat. The cracker should be flat to maximise the contact area with the oven band. Apart from the moisture gradient between the centre and edge of the cracker one must also ensure an even bake between the top and bottom of the cracker to avoid having a moisture gradient in this manner. Oven profiling may be useful to identify inconsistencies in the oven. Increasing production rates by shortening bake time and using higher temperatures may also be conducive to checking. Longer bake times may be required to achieve lower moisture levels and ensure a more thorough bake however this impacts production efficiency negatively and may also result in a lower product thickness. Rapid and aggressive cooling should be avoided. As the crackers cool the higher moisture present at the centre of the cracker migrates to the drier periphery causing the centre to shrink and the edges to expand. These movements and dimensional changes cause internal stresses which may give rise to hairline cracks. Stress cracks usually develop in the direction of travel through the oven. As crackers exit the oven they are very hot and still losing moisture. When the crackers are transferred to the cooling conveyors, moisture loss, temperature reduction and subsequent changes in the state of the main ingredients may cause stresses to form within the cracker until an equilibrium is reached. Rapid cooling may result in firming of the outer crust and consequently delay the moisture migration from the centre to the edges. The rate of cooling should be mild to ensure proper moisture equilibration. Where long cooling belts are used the relative humidity and temperature of the environment may also play a role. Travel of crackers to a cooler or lower humidity area, such as transfer to an air-conditioned area may cause a temperature shock and increase the risk of checking especially if the moisture gradient within the crackers is high. If draughts are present in certain areas covering of the product may be considered. Sudden temperature changes should be avoided. Crackers should not be left exposed to air for too long before packing due to moisture uptake from the environment. If the cooling time is too long, absorption of moisture from the air by the outer layers of the crackers may take place and further stresses may develop which can eventually also result in checking. Every stage of production, from mixing to packing can contribute to checking. Crackers made from a well balanced recipe, optimal process parameters and thoroughly baked with a minimal moisture gradient between the centre and periphery of the cracker will show a lower tendency to check.